“Don’t be dismayed at goodbyes. A farewell is necessary before you can meet again. And meeting again, after moments or lifetimes, is certain for those who are friends”. Richard Bach. It should be a loving compassionate place where all peaceful ideas are welcome. It should encourage underrepresented communities to come forward and have their say… and not just their say, but also an opportunity to reclaim what is rightfully theirs. It should amplify the voice of those who are under threat. It should be a safe place for all kinds of folks, no matter how diverse they are. It should definitely involve more barefeet dancing and conga lines after each important meeting. … And when something is not working quite properly, Jer  should be able to just fix it with his computer! I want to thank each and everyone who made this Summit happen, and to all the GVers who were there let me just say you’re all beautiful souls. It was a privilege to be in the same room with you and exchange so many thoughts and ideas about our organisation. 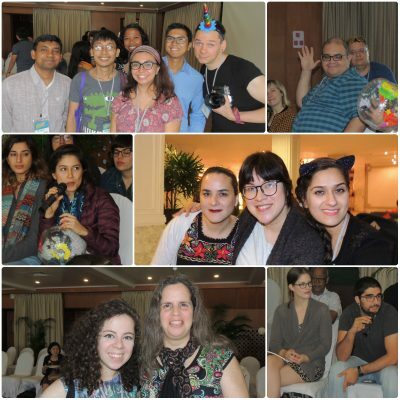 Some faces of the GV community during the 2017 Summit (internal sessions).